Midwives, friends and your Mum all know the secret… just ask them. Swaddling is the timeless practise of wrapping baby to recreate the security of Mum’s womb. It’s been around since dot and for good reason. Safe swaddling comforts and secures baby from their own startle reflex or moro reflex, without restricting natural movement. For healthy development, newborns need to breath freely, have movement of their arms and be able to naturally move their legs by kicking and frogging their little legs. Recent studies show incorrect swaddling can be harmful. This research centres around tight binding techniques which restrict movement and can even reduce full lung expansion. ‘Straight-jacket’ wrapping carries with it the risk of newborns developing hip dysplasia due to the lack of natural joint and bone movement through the hips and pelvis. Bubbaroo stand by the benefits of swaddling using the correct technique. We know firsthand the difference it can make in bringing solid slumber and peace during the first months of parenthood. But will it stop the crying? That’s what every new parent wants to know. Babies are natural wrigglers; moving arms and legs like athletes. Jolting movements cause them to startle and this repeated startling creates over stimulation. Crying is a baby's way of trying to stop the stimuli. Swaddling results in fewer sleep interruptions and less tears. Sleep quality is also a swaddle-strength. Swaddling is most successful when implemented for babies 8 weeks or younger when sleep patterns are in 3 to 4 hour intervals. It can help increase newborn REM sleep meaning baby is in deeper dozing and may not fully wake when roused. Less bedside parental pilgrimages means happier pilgrims! Parental anxiety is high around sleeping and anything that eases a running mind is a welcome tool. Safe swaddling has been proven to reduce the risk of Sudden Infant Death Syndrome (SIDS). Research indicates swaddled babies experience higher quality sleep with less squirming and therefore less possibility of moving onto their tummy. The combination of crying baby and exhausted Mum can also be a common trigger for Post Natal Depression (PND). With the increased sleep swaddling can bring, reduced chances of PND follow suit. Swaddling can aid in the early stages of breastfeeding. Instead of trying to achieve latch on through a blur of helicopter arms and soccer legs, the Joey Pouch® Swaddle Wrap keep baby’s hands and legs contained if this is posing a problem. This gives baby more focus to learn to feed. The Joey Pouch or Joey Pod Transitional Swaddle can also be used for night feeding or dream feeds so you don’t even have to disturb baby by unswaddling. Bubbaroo’s 100% cotton fabric helps keep baby covered and warm without the risk of overheating. Sharp newborn nails paired with constant jolting movements means babies can end up with awful scratches on their face – the Joey Pouch® or Joey Pod helps tame little ones talons and makes bub easier to pick up! When done right, swaddling can be an effective and safe way to keep your newborn covered, comforted and calm while sleeping. That’s the Joey Pouch®, Joey Pod and the Bubbaroo difference. See the image below to learn how to swaddle correctly. 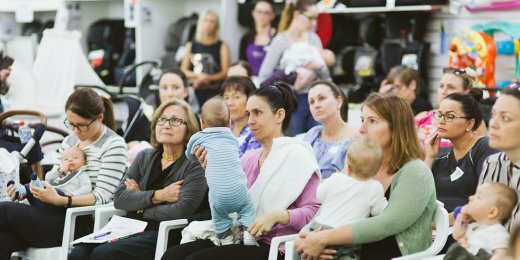 Concerned about the restrictive nature of many swaddle products on the market, we developed our Joey Pouch® and Joey Pod with a unique bell-shaped bottom to ensure full hip flex and freedom to kick for newborns. The Joey Pouch and Joey Pod allow baby to sleep as they wish without forcing their arms up or pinning their arms down. We’ve made safe swaddling easy with our Joey Pouch® – just 3 simple steps to simply, safely and effectively wrap your bundle. The Joey Pod Transitional Swaddle can be used to transition baby out of swaddling. We use a beautiful light-weight 100% knitted cotton waffle that can be used all year round by simply adjusting baby's clothing. With this versatile fabric, baby can still self-soothe by sucking on their fingers through the swaddle. All our swaddling products are packaged in a hanging box with in-depth information, instructions and a convenient door hanging temperature guide outlining what to wear with the Joey Pouch® or Joey Pod depending on the temperature of baby's room. Checkout if your baby is too hot or too cold for sleep? We bought a Joey Pouch last week and it’s amazing. Jac sleeps so much better… I haven’t been able to wash it yet – I was worried he wouldn’t be as good without it! Thanks for developing products that babies really respond to. From a less exhausted and grateful Mum. I just wanted to say how cosy and warm the new 3.5 tog sleeping bag we bought is! Our baby girl was waking up several times at night because of the cold. It’s made a world of difference so thank you! We use it under her Joey Pouch Swaddling Wrap which we also love! I bought the Joey Pouch for our newborn and was also given a number of other swaddle bags. At 8 weeks, she’s been diagnosed with hip dysplasia and has to wear a brace. The Joey Pouch is the only swaddle bag her braced legs can fit into… it’s reassuring knowing she’s warm at night without the position of her hips being compromised. What a great product!